The archaeologists have realized that the ancient Egyptian history could be divided into three separate periods, such as, “The Old Kingdom”, “The Middle Kingdom” and “The new Kingdom”. The Old Kingdom (2700 BCE-2200 BCE): At that time, Pharaohs had enjoyed the absolute power and they were considered as the representatives of the God on the earth. During this period a huge number of pyramids were built. Money to build all these great monuments was taken from the treasury. Pyramids were built mainly at Giza of Egypt. The first step pyramid was built by king Djozer. 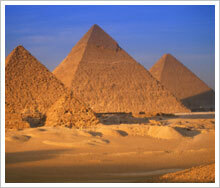 The three great pyramids of Khufu, Menkaura and Khaefra were also built during this period of time. Amongst all the pyramids, the 481 feet tall pyramid of Khufu was the biggest. These great pyramids were built with limestone, the burial chambers were built with granite and the outer castings were carved out of fine limestone. Even today, the archaeologists and scientists are unable to discover the actual process of building such great pyramids. It’s surprising that more than two millions of stone blocks, each weighing about two and half tons were used to build such of these great pyramids. The Pharaohs chose Memphis, which was located at the meeting point of the Lower and Upper Egypt, as their capital. The Middle Kingdom (2100 BCE-1800 BCE): Egypt strengthened its army base to protect herself from the enemies. The trade along with arts, science and literature flourished. During this time period the pharaohs became wise rulers. Those pharaohs came from Thebes and they brought their local God Amun with them. Amun gained power. People started believing him and began to worship as the king of the Gods. During The Middle Kingdom, the pharaohs were buried inside the hidden tombs instead of expensive pyramids. These intelligently hidden tombs were very hard to discover. The New Kingdom (1500 BCE-1000 BCE): During this kingdom, Egypt expanded her borders. The country was ruled by foreigners called the Hyksas kings. During The New Kingdom, the horse, the chariot and the bronze weapons were introduced as well. The kings were buried in a special geographic region called the Valley of the Kings.